Write an article about A' Design Award and Competitions' winners at your blog to earn a free Digital Edition enty ticket for you or your friends. How to take part in this program? 1. To take part in this program, please register for free by filling the registration form first. 2. 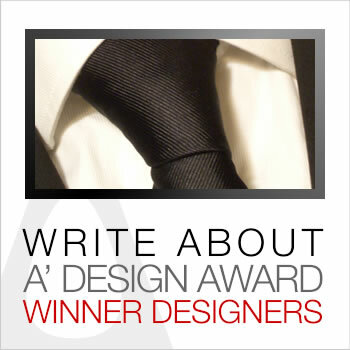 Write an article about A' Design Award & Competition's Winnersand post it at your blog. 3. Once you write your article, login to our platform and visit this page to fill the "Claim Nomination Tickets" form below (at the bottom of this page), indicating the article URL - link where you published. 4. We will check the URL. 5. You will receive your free entrance ticket within 2-3 days after your article is approved, remember to contact us otherwise. You can write either a Round-Up or Interview article. Round-Up Article: You should pick at least 5 winners you like from awardwinningdesign.org, and write an article about these winners in your blog by featuring them. You should include an image and you should write your own description about the designs. No copy-pasting! Designer Interview Article: Write an article about a designer and her winning entry. Use the content at Design-Interviews.com as a basis of your article. 1. Only 1 article per year / per blog. 3. You must have a developed blog (i.e. your blog should have at least 20 entries). 4. You must not copy-paste content from A' Design Award & Competition website, please write your own content. 5. Your article must be at least 200 words long total. 6. Please keep the article at least a year. 7. Your blog must be at least 1 year old. 8. Your blog must have at least 56 articles. Your post should be focusing on A' Design Award Winners. Please choose around 5-25 of our award winners you personally like from the list of awarded entries and mention them in your article. It is important to have comments for each mentioned design. Just 1-3 sentences is enough. We do not consider social networking pages or profiles as blogs. Please double check the URL before submitting.